Hera are thrilled to kick off 2019 by inking a two-book deal with successful women’s fiction writer, Jeevani Charika. 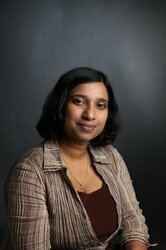 Jeevani, who also writes under the name Rhoda Baxter, is penning two novels for Hera, the first of which, This Stolen Life, will be published in May 2019. Jeevani is an active member of the Romantic Novelists’ Association and the Society of Authors, and her books have been shortlisted for the RoNA awards, the Love Stories awards and the Joan Hessayon award. World English language rights were acquired from Federica Leonardis at Martin Leonardis Literary Agency. Keshini said of the deal, ‘As soon as I read Jeevani’s book, I just knew we had to bring her to Hera. The story of Soma, a vulnerable young woman who flees her dangerous past in Sri Lanka to find sanctuary in England – all while keeping a devastating secret – had me completely engrossed. Everyone at Hera who read the book on submission felt similarly – there was much rejoicing when we agreed this deal! © 2019 Hera Books. Company no. 11358795.